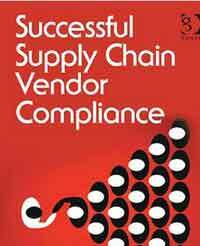 SCDigest recently broadcast an excellent Videocast on vendor compliance - featuring Norman Katz, author of the new book Successful Supply Chain Vendor Compliance. Also participating was Greg Holder, CEO of Compliance Networks. We reviewed Katz's excellent book on the pages of the Retail Vendor Performance Management Bulletin earlier this year, but in this broadcast we were to get into far more detail, as Katz and SCDigest editor Dan Gilmore discuss key issues around compliance program success. A lack of coordination between supply chain, merchandising, and marketing topped the list of barriers to supply chain execuition excellence (no surprise there) at 61% of respondents. • What is permissible under the law relative to vendor chargebacks? • The many "E's" of successful vendor compliance, from "Envision" to "Ethics"
After Katz, Holder offered his current take on the state of retail vendor compliance - a bit more upbeat that Katz's view - and then offered suggestions for both retailers and vendors on how to improve compliance program success. and subscribe to the monthly newsletter. This excellent broadcast is not to be missed for those interested in starting or improving vendor compliance programs. The analysts at RSR released a new benchmark report on supply chain execution, based on a survey of primarily US-based retailers. Here, we summarize some of the highlights, a lot of which - not surprisingly - focused on omnichannel issues. The top three inventory management challenges cited by survey respondents were: (1) inaccurate inventory levels in stores - 57%; (2) consistent stockouts on fast-moving categories/products - 46%; and (3) too many out-of-stocks in stores - 40%. Out-of-stocks at the distribution center level was down the list just a bit, cited by 37% of respondents as a major challenge. The report observes relative to inventory management that "What was "close enough" in a pure store-based environment and its consequent relatively low percentage of merchandise returns has become completely unacceptable in an omnichannel world." It adds that "Supply chain execution as it relates to managing inventory no longer works the way it used to, and retailers are struggling to adjust." Drop shipping by vendors to ecommerce customers is seen as important, but still well down the list from other fulfillment capabilities. 49% of respondents said vendor drop shipping was a "very valuable" capability, versus 71% saying direct customer shipments from DCs was very valuable. Just behind that was consumer shipments from stores (70%), ship to store for customer pick-up from ecommerce focused DCs (61%), and store-to-store transfers for customer pick-up (56%). However, just 9% of respondents said they have no plans to initiate vendor drop shipment processes. What are the largest barriers to improved supply chain execution? As shown in the chart below, lack of coordination between supply chain, merchandising, and marketing topped the list (no surprise there) at 61% of respondents, far ahead of number 2 "lack of confidence in inventory accuracy" at 44%, the same percentage as for "perpetual inventory rarely matches actual inventory levels" and "we don't have the right metrics or incentives to measure cross-channel supply chain efficiencies." Among other recommendations, RSR suggests retailers need to get more precise about what they really mean by supply chain visibility, including who really needs to see what, and just how real-time that visibility needs to be. There is a lot more detail in the full report, available for free with registration at the RSR web site.